Knitting: How Much Yarn Do You Need for Long Tail Casting? The long-tail cast on is consistently one of the most popular cast-on methods. It's a quick and easy way to cast on a large number of stitches quickly, and it gives your edge a nice, even look. It even counts as your first row of knitting! But there is a problem with using the long-tail cast on, and if you've used it a few times, particularly for a large number of stitches, you already know what it is. It can be really difficult to guess how much yarn you're going to need to form the cast on. Why Do We Need a Long Tail? Because of the way the long-tail cast on is formed, you're working with both ends of the yarn, and you need length from both the tail end and the ball end. It is different from, say, a knit or cable cast on, where you can leave a relatively short tail (just long enough for weaving in at the end of the project) and cast on as many stitches as you like. Is there anything more frustrating than casting on a whole bunch of stitches only to find out that your long tail isn't long enough for all the stitches you need to cast on? So how can we avoid that? There are a couple of different methods to help you estimate how long of a tail you need. The first one is great if you have a tape measure handy; just measure out one to two inches for every stitch you need, depending on how big the needles are. Bigger needles have bigger stitches and thus require more yarn. The other is not as scientific but works if you don't have any measuring devices handy. 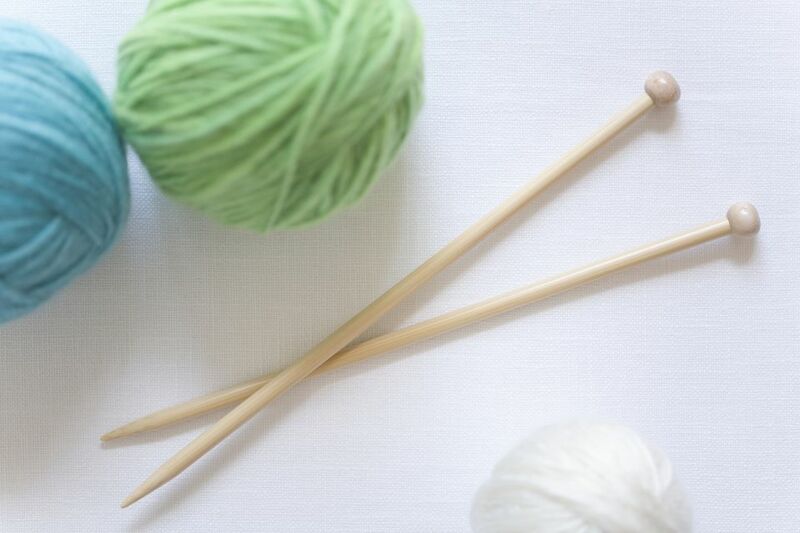 Just wrap the yarn around the needle you're planning to use, one wrap for each stitch. Add a few extra inches at the end for good measure. You could also wrap the yarn around both needles for a little extra insurance. Lily Chin, who is the master of the clever knitting shortcut, says to be extra sure you have enough yarn for your cast on, make the long tail three times the width of your finished project, plus 10 percent. So, for instance, if your finished project is going to be 12 inches wide, you'd want a long tail about 40 inches long (12 x 3 = 36 + 3.6 = about 40). She also reminds you to "keep your tail on your thumb," meaning that the tail end of the yarn goes in front as you make the stitches. If you still run out of yarn when you're working a long-tail cast on, there are some things you can do. If you're getting close but know you aren't quite going to make it, you can switch the position of the tail to the back of your hand. Less yarn is used from the back strand, and this may make enough of a difference to get you through. If your cast on edge isn't going to be visible when the knitting is done, you can cast on the remaining stitches with another method. I have done this before using the knit or cable cast on, but Lily Chin comes to the rescue again and advises turning the work and casting on the remaining stitches as a purl cast on instead (same as a knit cast on, just making purl stitches).